When I first entered the world of tourism, I started doing mostly field work. I would go as an assistant guide but also I would be at the office in charge of operating groups with my father, and then I became a trekking guide. Some years later I was in charge of administrating the agency I worked for. I believe my experience on the field was reinforced by my studies and enhanced the quality of my work. I am passionate about tourism and traveling because I feel that's how people interact and learn about different cultures. That's how people become more aware about what our planet has to offer, and learn to respect life, especially our environment. By working in tourism for so many years now I'm more aware of how important it is to be conscious about our environment and all the life in it. 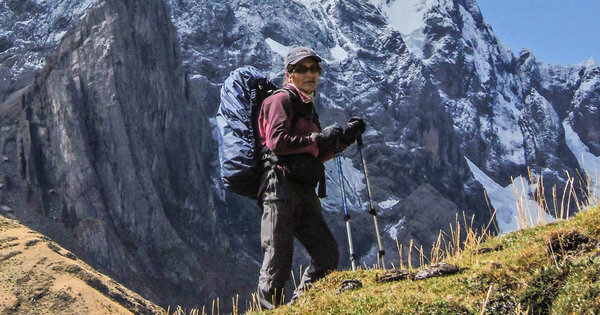 "The Cordillera Blanca is the place I have been working at for almost 35 years now. My speciality is operating groups that come for trekking and climbing. I'm in charge of the logistics and also the administrative area of our company. " "My father is a pioneer in alpinism here in Huaraz, so as a consequence I started working in tourism at a very young age, although I didn't fully understood it's potential as I do now. As years passed by, I'm aware, now, of many things that involve tourism besides just traveling. It's an experience that enlightens us about our environment, about cultural diversities, about life itself. " "My climbing to the Alpamayo summit ( 5947m.s.n.m ) is definitely one experience that I'll never forget. It was both mentally and physically challenging, but most of all I was very excited to see it's beauty, and finally understood why it is consider the most beautiful mountain in the world. "